Brand new Vans Authentic sneakers retail for $45. But a beater pair autographed by an up-and-coming artist will cost you more than that. And we mean WAY MORE. 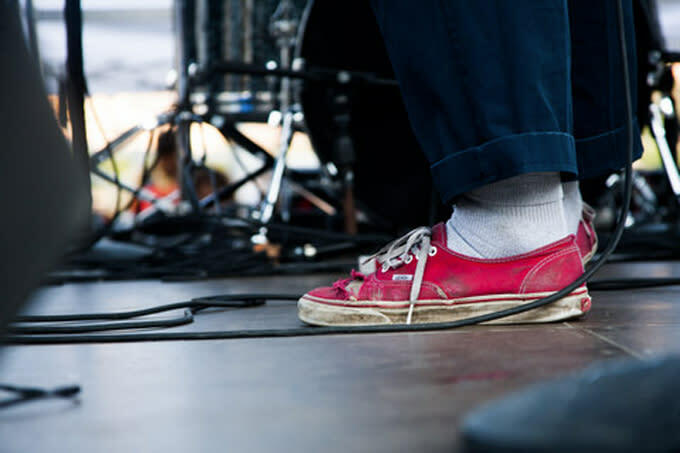 Indie rocker Mac DeMarco recently put up his worn-out pair of Vans on eBay and the red canvas sneakers are already over $10K. The sneakers, which are being auctioned off for the Willie Mae Rock Camp for Girls organization, were worn by DeMarco for six months while playing shows all over the world. And it looks like the Vans were the only sneakers in his rotation judging by the intense signs of wear, which includes ripped canvas. If you&apos;re a fan of the Salad Days artist and want to help out this awesome cause, you can check out the live auction here, which still has over six days to go. UPDATE 1/5/15: The auction for Mac DeMarco&apos;s worn-out Vans Authentics ended yesterday afternoon, and sold for $21,100. The auction had started at $0.99 just seven days earlier.